It’s here y’all!!! What could be better than Goat Yoga & Bunny Yoga, Easter weekend, on the farm?!?! Come join us and enjoy the beautiful spring scenery with the most joyful yoga class in town!! PLUS you’ll get to take pictures with your favorite famous goats as seen on the CMA’s, CMT, Pickler & Ben, Trisha’s Southern Cooking & HGTV's Property Brothers, just to name a few and our newest additions BUNNIES!!!! These classes are for a limited time only so get your tickets today!! Naaaa...maste!! 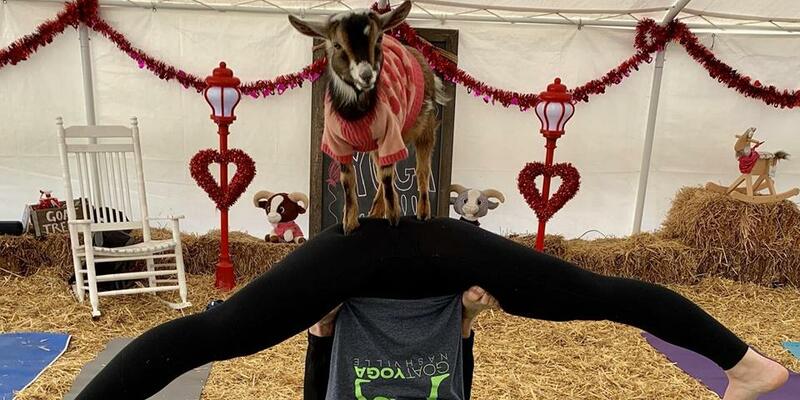 All ages are welcome, although, Goat Yoga may not be suitable for smaller children or children under the age of 8. They are still more than welcome to attend and participate but adults responsible for the children are required to supervise and watch younger children and ALL children at all times. ~Class is held Outside in a grassy area... however, under certain weather conditions and during the winter months classes will be held in a heated and enclosed event tent so no worries about the cold or rainy weather. Just remember to dress accordingly and then adjust to your own comfort level when you arrive.